Just over three years ago, my husband Flip, our daughter Laurel, and I founded our specialty food company. For two years we produced pasta & pizza sauces, single variety applesauces, condiments and pickled vegetables in a Bangor home. The company’s mission is simple: use Maine agriculture as an economic development strategy: contract with farmers to grow more Maine food, add value to it while employing Maine people, and supply committed Maine localvores with healthy, nutritious eating options all year. After two harvests, we recognized that profitability depended upon economies and efficiencies of scale, so we significantly expanded our operations and moved to Coastal Farms and Foods in Belfast. During the 2013 harvest, our company aggregated over 42 different crops from 63 Maine farms, and brought to market over 52 products, many of them certified organic. When Coastal went bankrupt in June of this year, we were stranded with no production facility. Determined to continue my research and work with local foods, we licensed the kitchen here at Rabbit Hill this summer. Now the cooler and freezer are running, the steam kettle is operational, and I’m cooking, despite the November storms! Welcome to the family and enjoy! There are 23 trees in our orchard, located on the rolling fields of the 1840’s salt-water farm on the road to Rabbit Hill. Although we don’t know all the varieties, the combination of tart, sweet and tannic from the apples makes a delicious juice, and a delicate, sparkling, hard cider. 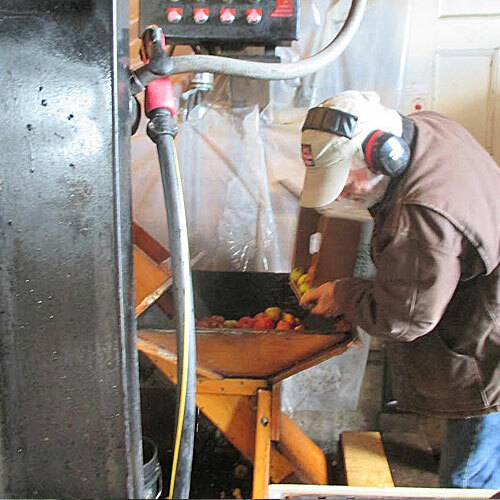 Flip harvests in September and October, and the last weekend of October, Bob Sewall at Sewall Orchards in Lincolnville presses the apples into juice. About 30 gallons are canned to drink as a beverage for breakfast, and the remainder goes through a 2-step fermentation process, not unlike champagne produced in France. The first stage is in a five-gallon carboy, and then on a “clear day in March”, the wine is siphoned off and bottled, usually ready to consume by mid-July. This year, we are delighted to share with you a taste of the 2012 vintage. This is a repeat of our delicious chutney from last season. We simmer cranberries with onions, apple cider vinegar, cane sugar, candied ginger, lemon peel and spices, then gently cook with Luscious pears. Just in time for Thanksgiving, try our chutney as a condiment with roast turkey or pork. Spread Cranberry Pear Chutney on a chicken sandwich, or for an easy appetizer, layer over your favorite local goat cheese (We like Appleton Creamery and Red Barn Farm). In past years, CSA shareholder specials were a way for us to get new product feedback. Although I intend to continue to develop new products, due to our limited production capacity, it won’t be as numerous as other seasons. However, as part of our extended “family”, we do want to share with you some very special things we produce here on the farm. IF they are not things your family will enjoy, please let me know. We aim to please! « Production is up and running!